Ecommerce and online retail is a booming sector, but because the latest marketing techniques change so rapidly it can be tricky to keep up with the latest trends whilst also keeping your feet on the ground. Wolfgang Digital have a useful E-commerce 2019 KPI report based on data from their European and US-based international clients. It's based on an analysis of over 250 million website sessions and over €500 million in online revenue over the 12 months from July 2017 to June 2018. The data clearly shown the importance of paid and organic search marketing which account for over 50% of retail visits. Email marketing and social media are surprisingly low in comparison - they may be under-represented depending on how well tracking of these channels has been set up in their retail clients. Social media traffic is significantly higher in the online-only pureplay retailers. Paid and organic search are also important for retail sales, but referrals from other sites i.e. including affiliate marketing are lower here. Yotpo collated data from 65 million ecommerce orders representing $2 billion dollars in transactions over 120,000 ecommerce stores and established what the industry average is for digital media. The results make for slightly surprising reading. On the face of things, Social makes up a healthy 6%, but this is still a relatively small slice of the overall pie. Paid makes up 5%, which leaves considerable room for growth, whilst email makes up a rather small 3%. The email figure is down to the data source - if you take a look at the Custora data on what influences sales it gives a different picture showing the importance of email to Ecommerce. It would be interesting to see the conversion rates by traffic, as it may be that referrals from emails are on the site because they’ve decided to purchase, whilst those from other sources may be more likely to be there to browse or research. I was slightly surprised that search didn’t make up a larger share since it is how most customers generally start their buying journey. Investing in better content marketing efforts could be more than worth it for many ecommerce stores, if done well it will attract quality links and boost SEO. Relying too much on one source of traffic leaves you exposed to risks, just because a channel is fantastic for generating traffic today doesn’t mean it will continue to be. Some sites lost out when Panda put penalties on certain SEO linking practices. Others lost out when Facebook decided to massively restrict organic reach. If your site had relied exclusively on one of these sources of traffic then the changes will have put you in some serious trouble. The best way to avoid these risks is by hedging your bets by acquiring your traffic from a considerable variety of sources. But what is a good variety? That’s where the data comes in. The big surprise in many ways is how large a proportion of traffic comes from direct. 40% of traffic came from direct, which accounts for more ecommerce traffic than any other single source. Direct in theory is the people who have typed in the URL directly to their browser, but in reality, it means anyone who arrives at the site from a source that cannot be tracked. The source of this traffic is generally links that have been sent to friends/colleagues and then copied and pasted into web browsers. Traffic of this kind is generally referred to as ‘dark social’, as it is comprised of links that are shared socially, but cannot be tracked. This means ‘dark social’ actually accounts for a considerable percentage of direct traffic. By its very nature, it is difficult to accurately account for what percentage of your direct traffic is actually ‘dark social’. However with direct accounting for 40% of ecommerce traffic, it seems likely dark social is making up a large proportion of the total. A general rule of thumb is that for every three people reaching your site via social, a further 7 will be arriving from ‘dark social’, which will appear as direct. If this is true for ecommerce traffic then dark social accounts for half of all the direct traffic, which is 20% of the total traffic. This makes dark social the 3rd largest source of ecommerce traffic by a considerable margin. Bear that mind when designing your landing pages and crafting the copy for your social shares. Social is probably more important to your bottom line than you think. Other statistics on the most popular traffic sources and media channels for retailers? If you're not aware of it the excellent Custora Ecommerce Pulse shows orders by channel and is also of interest for retailers to benchmark against. This is the latest data in 2016 compared to 2015. It's a compilation showing traffic or media sources from some of the top US retail sites which drive sales. What channels draw the most engaged traffic? 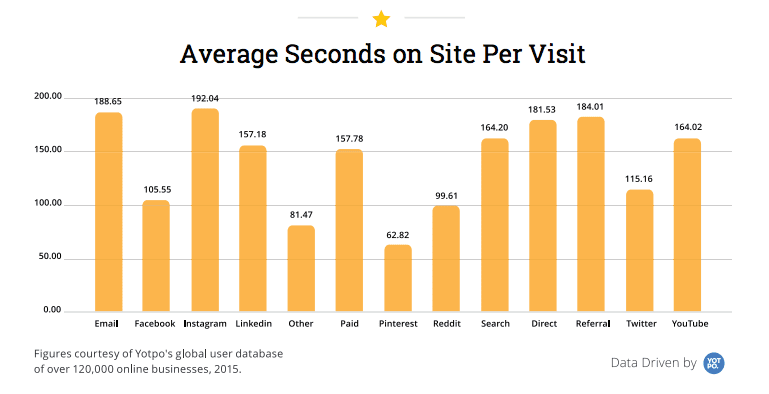 Not all clicks are equal, and some visits are more valuable than others. Some channels bring traffic that is more likely to spend plenty of time reviewing the site, whilst others are more likely to bounce back relatively quickly. Email, Instagram and referral are the stars here. Conversely, Pinterest and Facebook bring traffic likely to spend only half as much time on site as the top performers. It is important to tie this information into budget allocation models, as a click from an email may be worth considerably more than one form Pinterest for example. Mobile has been a buzz word in digital for several years now, to the point where it seems almost outdated to talk about how important it is as everyone should know by now. 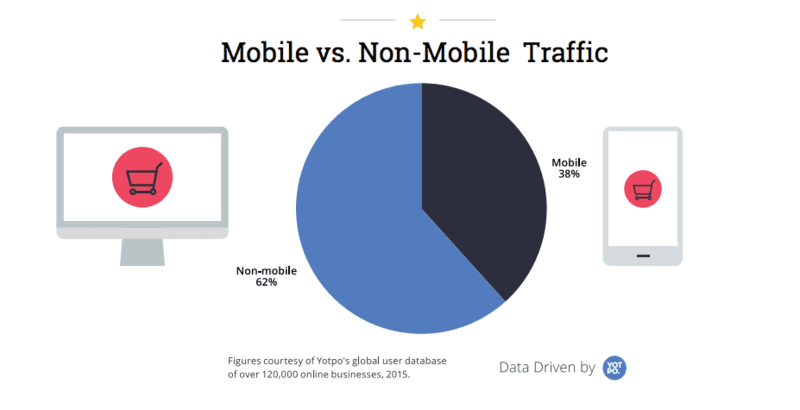 Mobile now makes up the majority of visits across the web, but this is not the case for ecommerce. Because of the fiddly nature of payment forms, mobile accounts for slightly over 1/3rd of all ecommerce visits. If your rate of mobile traffic is lower than this it might be worth seeing if your site needs further optimisation for mobile. Responsive design should be your first priority, and if this is already in place then it may be worth a bit of user testing to see if the customer journey is as smooth on mobile as it is on desktop. We hope this ecommerce traffic data has been helpful for benchmarking where you currently are against the industry average. 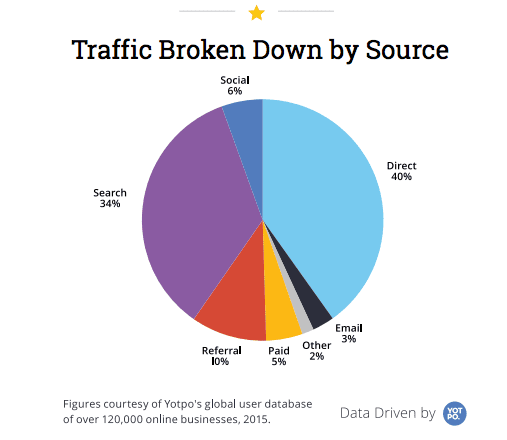 If you want more data on ecommerce traffic you can see the full report from Yotpo. For more advice on making the most of your ecommerce traffic check out our ecommerce design pattern guide. We created this guide to give our members a definitive reference of best practice for the design of key website page templates essential in retail ecommerce websites.The purpose of this guide is to give you a toolkit to use to review tests to optimize existing templates, or alternatively, as a blueprint that can be adapted when you are planning a site redesign.